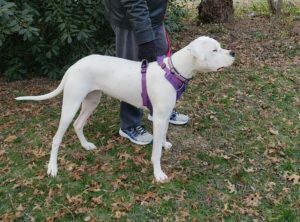 Karma is an 18-month-old Dogo Argentino weighing about 60 pounds. She has basic obedience and responds to hand signals. 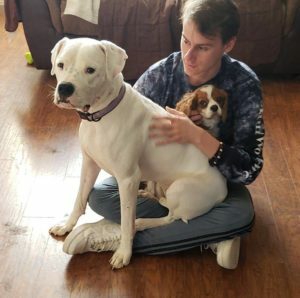 She is crate trained but prefers to be around her people and other dogs. She is a great car rider, walks well on a leash and is house-trained. She is such an amazing dog. We think she is the kind of dog that is life enriching for everyone involved. She has absolutely no aggression towards other dogs or humans. But proper introductions are always a must. She is also a Velcro dog. And she is a Ninja. You suddenly turn around and there she is. She loves people, being near them, or on them, it doesn’t matter. She has adjusted to her new foster home and routines like a champ. Karma gets along with dogs big and small and is well socialized. She is not cat tested but we think she would be fine with them. Karma can be high energy at times, but quickly settles down, but she is still young and will settle more as she gets older. 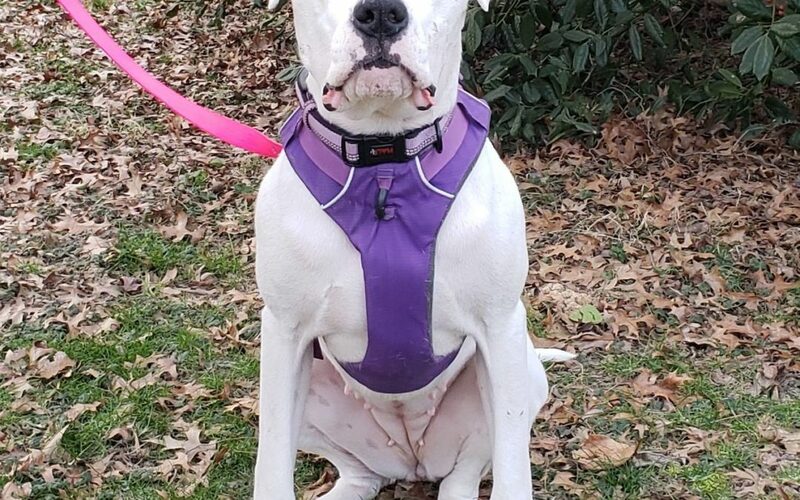 She would be best suited for a home with another dog(s), a working farm, or someone who stays at home and is looking to do advanced training and will give her mental stimulation. Since the Dogo Argentino comes from a hound heritage, she can smell a cracker crumb from 500 yds. Maybe some training teaching her to find things through sent, would be a great training activity. She will need to find a home with large breed and/or Molosser breed experience. Molosser breeds are not for first time dog owners. She cannot be adopted to any home that is a rental and she must have a fenced yard (and not an electric fence). Karma has idiopathic canine epilepsy, which is controlled with her medications. Karma came to us via The Wally Foundation (TWF). TWF is Karma’s foster family’s non-profit that assists low income dog owners with medications and medical treatments related to canine epilepsy. TWF will be available to any adopter that is not familiar with canine epilepsy. Karma is up to date on all of her vaccines, micro chipped, and spayed. If you are interested in Karma, please fill out an application. We will contact you for a meet and greet once we get your application.